Preheat oven to 220°C. Allow venison roast to come to room temperature before cooking. Combine 1 tablespoon of oil, thyme, and half the garlic in a large bowl. Coat venison with mixture and leave to marinate for a few minutes. Heat a heavy-based frying pan over a high heat. Season venison to taste and then sear roast for 2-3 minutes each side. Transfer venison to a small roasting dish. Roast in hot oven until done to your liking (16 minutes for medium-rare). Trim baby fennel bulbs of leaves and excess stalks. Place in a steamer over boiling water and cook for 6-8 minutes until just tender. Remove meat from oven, cover with tin foil and a clean tea towel and allow to rest for 10 minutes. Meanwhile, make the sauce. Return the same frying pan used to sear the venison to the heat, add remaining oil, onion and remaining garlic and gently fry until soft and smelling delicious. Add wine. Simmer until mixture is reduced and thick and syrupy. Add blueberries and simmer for about 5 minutes. Season to taste. 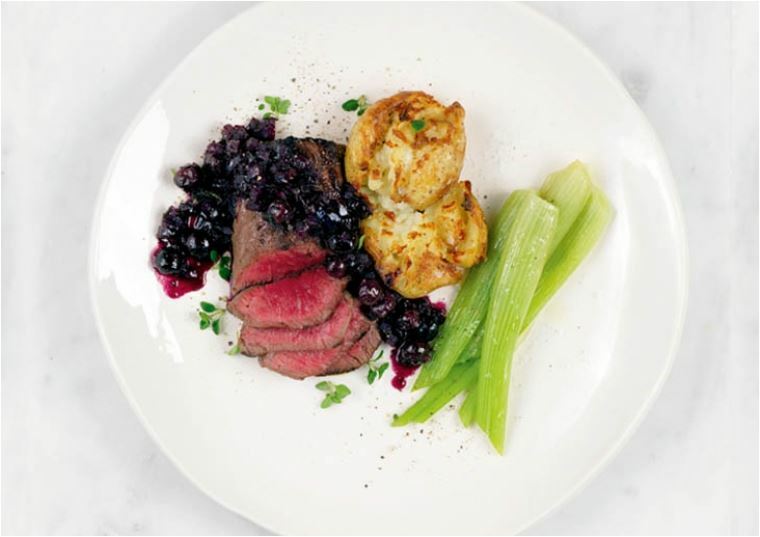 Serve venison with steamed baby fennel and roasted smashed potatoes. Garnish with fresh thyme leaves.